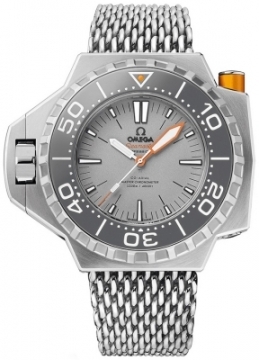 Buy this new Omega Seamaster PloProf 1200m 227.90.55.21.99.001 mens watch for the discount price of £8,280.00. UK Retailer. Availability Estimated 30 Day Delivery Want it sooner? A reincarnation of the 1970 rugged & robust diving watch. The predecessor was water resistant to 600m & named the PloProf which are the first letters of "Plongeurs Professionnels" (the French words meaning "Professional Divers"). The modern version of this Massive Diving watch is capable of withstanding the crushing pressures endured by deep-sea divers. Brushed/satin finished titanium case with polished finished beveled corners. Helium escape valve located on the case edge at the 4 o'clock position. The Helium Escape Valve allows helium to safely escape the watch during decompression when operating from diving bells. Applied polished dark rimmed hour markers filled with luminous fill. White hour hand with luminous fill. Over-sized orange aluminum minute hand with luminous fill. White seconds hand with orange tip & small rectangle luminous filled segment. Left hand crown encased with a crown-protector. The crown protector is locked & unlocked by screwing down or unscrewing the crown. The crown is located on the left side of the case so as not to restrict wrist movement. Brushed & polished titanium bezel with grey silicon nitride fill. Security bezel-lock. By pressing down on the orange anodized aluminum button located at the right side of the case one can turn the bezel either way. Allows for micro adjustment by way of a unique push-button release & then easily tightened to fit. Regular 26mm diver extension for comfortable wear over a diving suit. Provided with an additional grey rubber strap. Omega caliber 8912, beats at 25,200 vph, contains 39 Jewels & has an approximate power reserve of 60 hours, courtesy of its twin barrels mounted in series.